At the invitation of President Julius Maada Wonie Bio of the Republic of Sierra Leone, President Xi Jinping's Special Envoy and Minister of Science and Technology Wang Zhigang will travel to Freetown, the capital of Sierra Leone, to attend the inauguration ceremony of President Julius Maada Wonie Bio on May 12. Sierra Leone is an important cooperative partner for China in Africa. During the past 47 years since the establishment of diplomatic ties, our two sides have long valued sincerity, friendship and equality and fruitful outcomes have been achieved in our mutually beneficial cooperation across the board. The friendship between our two sides serves the fundamental interests of our two countries and two peoples. China values its relations with Sierra Leone and we stand ready to join hands with Sierra Leone to add more dimensions to our comprehensive strategic cooperative partnership and deliver greater benefits to our two countries and two peoples. At the invitation of State Councilor and Foreign Minister Wang Yi, Yousef Bin Alawi Bin Abdullah, Minister Responsible for Foreign Affairs of the Sultanate of Oman will visit China from May 12 to 16. During Minister Alawi's visit to China, State Councilor and Foreign Minister Wang Yi will hold talks with him, during which the two sides will exchange views on China-Oman relations and international and regional issues of common interest. China and Oman enjoy traditional friendship. This year marks the 40th anniversary of the establishment of our diplomatic ties. Recent years have witnessed the rapid growth of China-Oman relations. Our two countries always support and understand each other on issues related to each other's core interests and major concerns. China is willing to work with Oman to take the 40th anniversary of the establishment of diplomatic ties as an opportunity to further cement our traditional friendship, enhance political mutual trust, elevate cooperation in various areas and move forward China-Oman friendly cooperative relations. At the invitation of French Minister of Europe and Foreign Affairs Jean-Yves Le Drian, Spanish Minister of Foreign Affairs and Cooperation Alfonso María Dastis Quecedo, Portuguese Foreign Minister Augusto Santos Silva and Argentine Minister of Foreign Affairs and Worship Jorge Marcelo Faurie, State Councilor and Foreign Minister Wang Yi will pay official visits to the aforementioned four countries and attend the G20 Foreign Ministers' Meeting in Argentina from May 16 to 24. Q: You just announced State Councilor and Foreign Minister Wang Yi's upcoming visit to France. As we all know, the China-France relations have always been at the forefront of China's relations with Western countries, and there have been frequent high-level exchanges between the two countries. So what is the main purpose of State Councilor Wang Yi's visit? Who is he going to meet and hold talks with? Will they discuss the Iranian nuclear issue, the Syrian issue and other hot-spot issues? A: France is a permanent member of the United Nations Security Council, a core state of the European Union and an important member of the G20. It is the first major Western country to establish official diplomatic ties with China. In recent years, the China-France relations have enjoyed sound and steady development with ever deepening across-the-board practical cooperation and close communication and coordination in international affairs, playing a positive role in promoting our respective development and world prosperity and stability. In January this year, French President Emmanuel Macron paid a successful state visit to China and the two heads of state reached important consensus on further elevating the China-France comprehensive strategic partnership. During his visit to France, State Councilor and Foreign Minister Wang Yi will meet with President Emmanuel Macron and the President's diplomatic advisor Philippe Etienne respectively, and hold talks with Foreign Minister Jean-Yves Le Drian. Our two sides will exchange in-depth views on implementing the consensus reached by the two heads of state, conducting high-level exchanges and advancing practical cooperation in various fields, as well as the China-Europe relations and major international and regional issues of common interest. Q: You just announced that State Councilor and Foreign Minister Wang Yi is going to visit Argentina and attend the G20 Foreign Ministers' Meeting. There have been frequent high-level exchanges between China and Argentina in recent years, so how do you comment on the current bilateral relations? 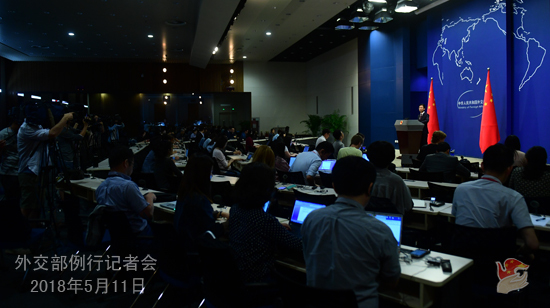 What topics will come up during State Councilor Wang Yi's visit? And what propositions will China take to the G20 Foreign Ministers' Meeting? A: Argentina is a major Latin American country and an important emerging market, chair of the G20 in 2018 and a comprehensive strategic partner for China. Recent years have witnessed the rapid and comprehensive development of China-Argentina relations. President Xi Jinping has met with President Mauricio Macri for three times, reaching important consensus on stepping up across-the-board mutually beneficial and friendly cooperation and charting the course for the development of bilateral relations. During his visit to Argentina, State Councilor and Foreign Minister Wang Yi will meet with President Mauricio Macri and hold talks with Foreign Minister Jorge Marcelo Faurie. Our two sides will exchange in-depth views on the development of bilateral relations under the new circumstances, the practical cooperation in various fields, the preparations for the G20 summit and other international and regional issues of common interest. When attending the G20 Foreign Ministers' Meeting, State Councilor and Foreign Minister Wang Yi will expound China's position and propositions on such three issues as the nature and function of the G20 mechanism, multilateralism and global governance, and the actions to realize equitable and sustainable development. He will also hold bilateral meetings with his counterparts of relevant countries, and exchange views on bilateral relations and major international issues with them. Q: It is reported that the DPRK-US summit will be held in Singapore on June 12. What is your comment? What are China's expectations for this summit? 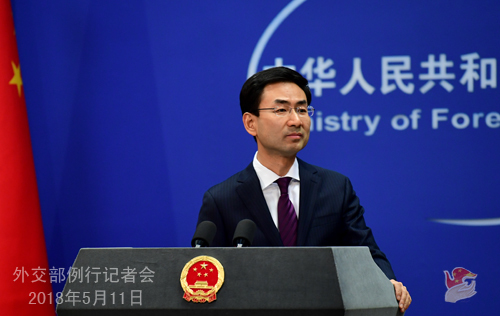 A: China welcomes the positive progress achieved by the DPRK and the US in preparing the summit. We hope that the summit can achieve positive outcomes and an important step can be taken towards advancing the denuclearization of the Korean Peninsula, politically resolving the Peninsula issue and achieving the lasting peace and stability of the region. Q: According to reports, Japanese Prime Minister Shinzo Abe said that China and Japan have reached new consensus on the co-production of films. Could you give us more details? Will the two sides sign any agreement in this regard? Does China have any tentative ideas for the co-production of movies with Japan? A: During Premier Li Keqiang's official visit to Japan, our two sides inked the Agreement on the Co-production of Films between the Chinese Government and the Japanese Government. The signing of this agreement will provide policy guarantee for the shooting and making of co-productions and play a positive role in promoting the cooperation between the two countries' movie industries. The art of film has always served as a special bridge between different countries, fostering a close bond and enhancing friendship between people. Since the Treaty of Peace and Friendship between China and Japan was signed 40 years ago, the film industries of the two countries have always maintained close communication and cooperation. Many Japanese films and TV series have been familiar to Chinese people and a growing number of Chinese movies and TV series have found their way to Japanese households. Moreover, in recent years, our two sides have co-produced some outstanding movies. China and Japan are the world's second and third largest film markets. We hope that our two sides will continue to step up our exchanges and cooperation in film-making, build the cultural industry into a new highlight of our practical cooperation and bring closer the hearts of our two peoples so as to make new contributions to the sustained improvement and development of China-Japan relations. Q: According to reports, the Catholic Archbishop of Taiwan has said that he would like to invite the Pope to visit Taiwan next year. If such a visit did take place, what impact might this have on the establishment of diplomatic relations between China and the Vatican? A: I have not seen the report mentioned by you. There is only one China in the world. The one-China principle is a universal consensus shared by the international community. Accepting this principle conforms to the trend of the times and reflects the will of the people. Q: With regard to the DPRK-US summit, will President Xi Jinping visit Singapore on June 12 or before or after that? A: We hope that the DPRK-US summit can achieve positive outcomes. Q: According to reports, on the evening of May 10, Mahathir Mohamad, chairman of the Pakatan Harapan and the former Prime Minister of Malaysia was sworn in as Prime Minister. What is your comment? A: Just as I said yesterday, Mr. Mahathir is a senior politician and made positive and important contributions to the development of Malaysia and ASEAN, China-Malaysia relations and East Asian cooperation. China congratulates him on assuming the post of Prime Minister. We believe that under his leadership, Malaysia will score new achievements in its national development and the China-Malaysia comprehensive strategic partnership will move forward in a steady and sustained manner. Q: Regarding State Councilor and Foreign Minister Wang Yi's visit to Spain, do you have more details? A: Spain is an important member of the European Union and a permanent guest member of the G20. This year marks the 45th anniversary of the establishment of China-Spain diplomatic ties. Our bilateral relations have enjoyed a sound momentum of growth as evidenced by frequent high-level exchanges and ever stronger political mutual trust. 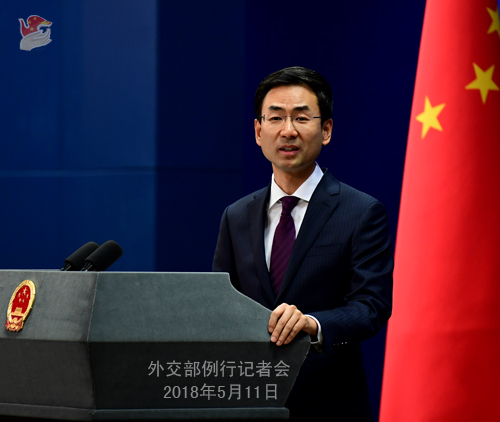 Our two countries have reaped early harvests on the Belt and Road cooperation, created many highlights in our practical cooperation covering the economic, trade, cultural, police and judicial fields and maintained good communication and coordination in international organizations such as the United Nations. During his visit to Spain, State Councilor and Foreign Minister Wang Yi will meet with King Felipe VI and Prime Minister Mariano Rajoy Brey on separate occasions, and hold talks with Foreign Minister Alfonso María Dastis Quecedo. Our two sides will have an in-depth exchange of views on further promoting the development of China-Spain relations and China-Europe relations under the new circumstances, forging closer high-level exchanges and seeking greater synergy between our strategies and deepening practical cooperation under the Belt and Road framework. Q: According to reports, Iranian Foreign Minister Mohammad Javad Zarif Khonsari will arrive in Beijing on Sunday. Can you confirm it? If yes, do you have more details? A: China and Iran have always maintained close communication and exchanges. Q: According to reports, Israel hit Iranian military targets in Syria, saying that it was a reaction to Iran's attack on Israel. What is your comment? A: We have noted relevant reports. We hope that the relevant parties can stay cool-headed and restrained to jointly uphold regional peace and stability.